Pope Francis arrived in Kaunas this Sunday morning. At St. George Church, one of the oldest Gothic churches in Kaunas, he transferred to the popemobile and moved to Santakos Park, where over 100,000 people from all of Lithuania and neighboring countries awaited him. The Roman Pontiff circulated in Santakos Park in the popemobile, blessing people and greeting them. On his arrival, the choir welcomed the successor of Saint Peter with the traditional Latin hymn “Tu es Petrus” (“You are Peter (Rock)”), a common composition when receiving the Pope. 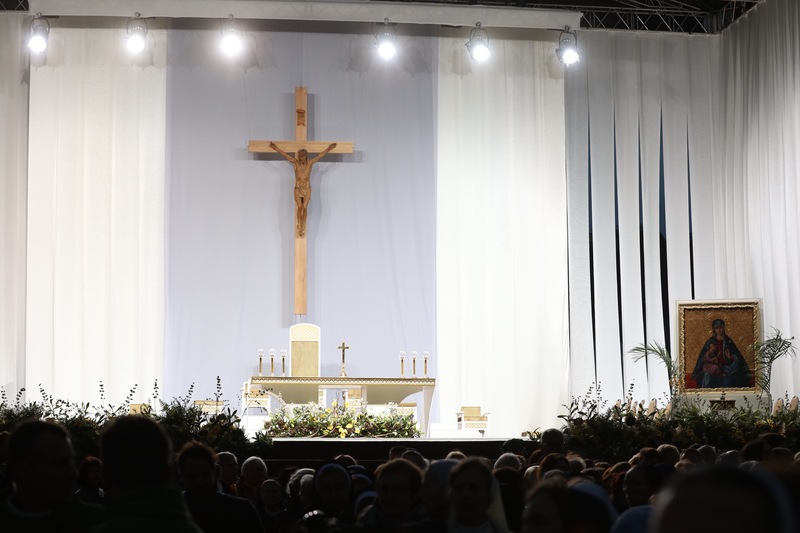 Led by Pope Francis, the Holy Mass at Santakos Park is being concelebrated by Archbishop Lionginas Virbalas, the bishop of Kaunas, Archbishop Gintaras Grušas, who is president of the Lithuanian Bishops’ Conference, more than 30 other bishops from Lithuania and abroad, and over 800 priests from Lithuania and other countries including Poland, Belarus, Latvia, Russia and Iceland. The hymns for the Mass include some that are well-known in Lithuania and some composed especially for this occasion. Performing them is a combined choir of 260 persons from all parts of Lithuania. The Kaunas wind orchestra Ąžuolynas and Ainiai musical ensemble are on hand to accompany the hymns of a more national character with Lithuanian folk instruments. On the altar is the original icon of the Trakai Mother of God, Patroness of Lithuania, one of the most venerated images of the Mary in Lithuania, renowned for many special graces, which was first adorned with papal crowns exactly three centuries ago this year. Beside it in a marble vase is a gilded rose made by Italian craftsmen, a gift of gratitude (votive offering) to the Blessed Virgin from Pope Francis, whose deep devotion to the Holy Mother of God is well known. Also on the altar are the relics of Blessed Teofilius Matulionis, a Lithuanian priest and later bishop who suffered greatly under the Soviet regime and whom the Pope beatified last year as a martyr. Later in the day Pope Francis plans to pray at a site in Vilnius where Matulionis was imprisoned. The Mass is being celebrated in Latin. More than 200 people are helping to distribute Holy Communion, including priests, seminarians and lay assistants.